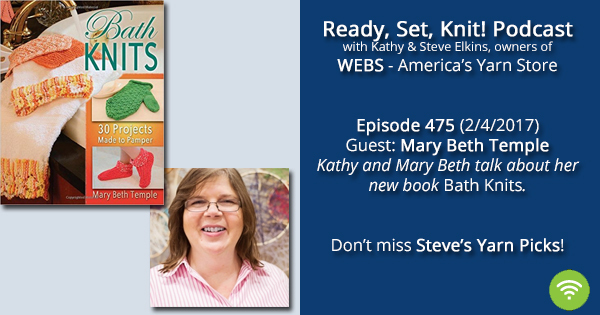 This week Kathy talks with author Mary Beth Temple about her new book Bath Knits. 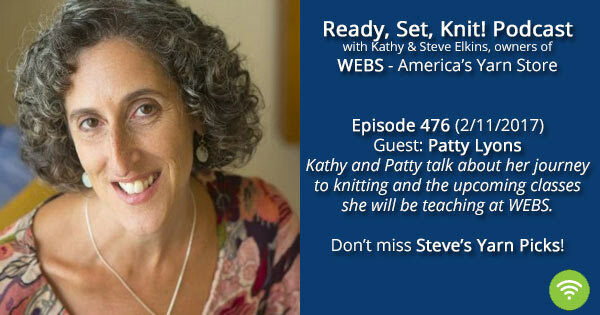 Mary Beth talks about what makes this book of accessories distinct from other knitting books. 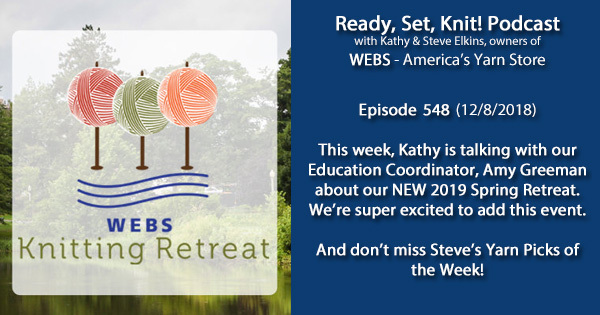 Registration for WEBS Fall Retreat will open on Wed Feb 8th at noon, check the Ravelry group: WEBS Knitting Retreat for more info. We love stitch dictionaries here at WEBS and the latest one to arrive is fantastic. 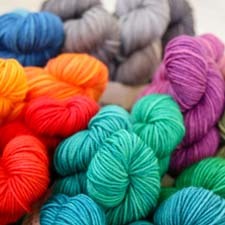 Wendy Bernard’s (of Knit and Tonic) newest book, The Knitting All Around Stitch Dictionary is the follow-up to her popular Up Down, All-Around Stitch Dictionary, and features 150 new stitch patterns for knitting in every direction. 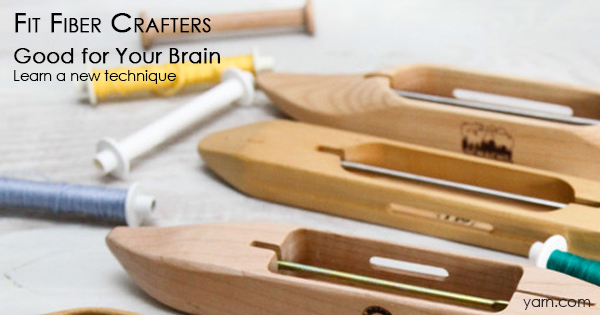 Not only does it have the stitch patterns and directions, every chapter includes a pattern so you can put the stitch patterns to use! 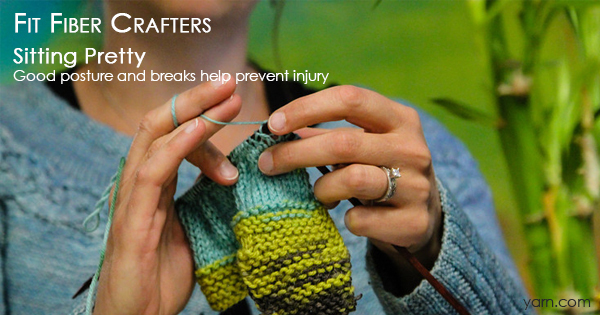 The book is spiral-bound, which makes it incredibly easy to knit from. 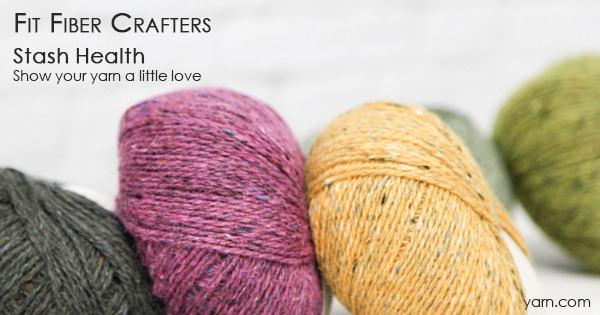 As part of the blog tour, we’re excited to be able to share with you not only a stitch pattern from the book, but also a giveaway of the book and 2 hanks of yarn from Blue Sky Alpacas, who provided the yarn for the book. 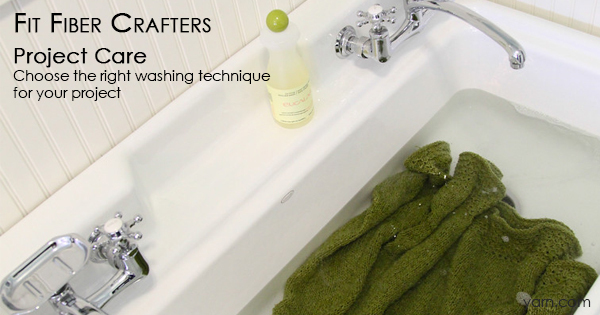 First things first, the stitch pattern! The Fern Grotto Lace pattern is a lovely pattern that has directions for knitting flat and in the round, both bottom-up and top-down. ROW 1 (RS): *K1, yo, k3, ssk, k10, k2tog, k3, yo; repeat from * to last st, k1. ROW 2: P1, *p1, yo, p3, p2tog, p8, ssp, p3, yo, p2; repeat from * to end. ROW 3: *K3, yo, k3, ssk, k6, k2tog, k3, yo, k2; repeat from * to last st, k1. ROW 4: P1, *p3, yo, p3, p2tog, p4, ssp, p3, yo, p4; repeat from * to end. ROW 5: *K5, yo, k3, ssk, k2, k2tog, k3, yo, k4; repeat from * to last st, k1. ROW 6: P1, *p5, yo, p3, p2tog, ssp, p3, yo, p6; repeat from * to end. Repeat Rows 1–6 for Fern Grotto Lace Bottom-Up Flat. ROW 1 (RS): *K1, yo, k3, ssk, k10, k2tog, k3, yo; repeat from * to end. ROW 2: *K2, yo, k3, ssk, k8, k2tog, k3, yo, k1; repeat from * to end. ROW 3: *K3, yo, k3, ssk, k6, k2tog, k3, yo, k2; repeat from * to end. ROW 4: *K4, yo, k3, ssk, k4, k2tog, k3, yo, k3; repeat from * to end. ROW 5: *K5, yo, k3, ssk, k2, k2tog, k3, yo, k4; repeat from * to end. ROW 6: *K6, yo, k3, ssk, k2tog, k3, yo, k5; repeat from * to end. Repeat Rows 1–6 for Fern Grotto Lace Bottom-Up in the Round. ROW 1 (RS): K1, *k5, k2tog, k3, yo, k1, yo, k3, ssk, k5; repeat from * to last st, k1. ROW 2: P1, *p4, ssp, p3, yo, p3, yo, p3, p2tog, p4; repeat from * to last st, k1. ROW 3: K1, *k3, k2tog, k3, yo, k5, yo, k3, ssk, k3; repeat from * to last st, k1. ROW 4: P1, *p2, ssp, p3, yo, p7, yo, p3, p2tog, p2; repeat from * to last st, k1. ROW 5: K1, *k1, k2tog, k3, yo, k9, yo, k3, ssk, k1; repeat from * to last st, k1. ROW 6: P1, *ssp, p3, yo, p11, yo, p3, p2tog; repeat from * to last st, k1. 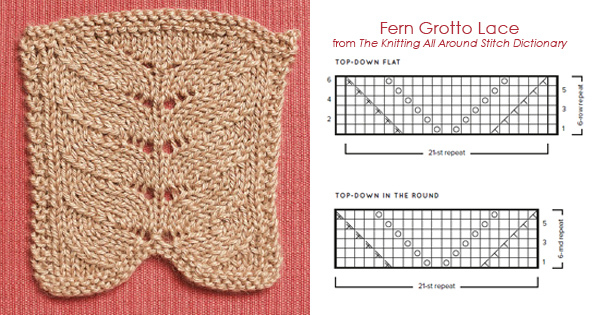 Repeat Rows 1–6 for Fern Grotto Lace Top-Down Flat. ROW 1 (RS): *K5, k2tog, k3, yo, k1, yo, k3, ssk, k5; repeat from * to end. ROW 2: *P4, k2t0g, k3, yo, k3, yo, k3, ssk, k4; repeat from * to end. ROW 3: *K3, k2tog, k3, yo, k5, yo, k3, ssk, k3; repeat from * to end. ROW 4: *K2, k2tog, k3, yo, k7, yo, k3, ssk, k2; repeat from * to end. ROW 5: *K1, k2tog, k3, yo, k9, yo, k3, ssk, k1; repeat from * to end. ROW 6: *K2tog, k3, yo, k11, yo, k3, ssk; repeat from * to end. 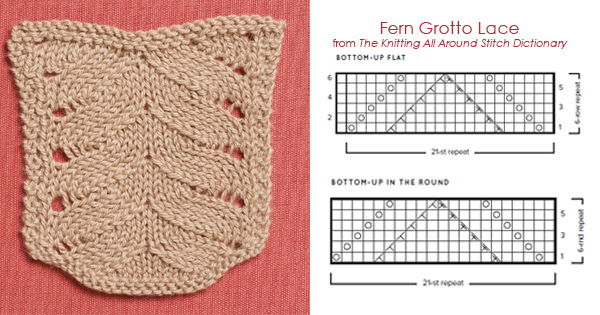 Repeat Rows 1–6 for Fern Grotto Lace Top-Down in the Round. And now the giveaway! 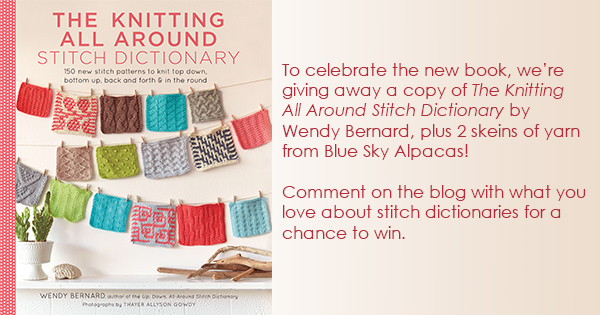 Please comment here on the blog by May 18, 2016 with what you love about stitch dictionaries for your chance to win. Make sure you use your email address so we have a way to contact you and get your mailing information. The final accessories of your bear use all the skills you’ve used in previous weeks of the KAL. 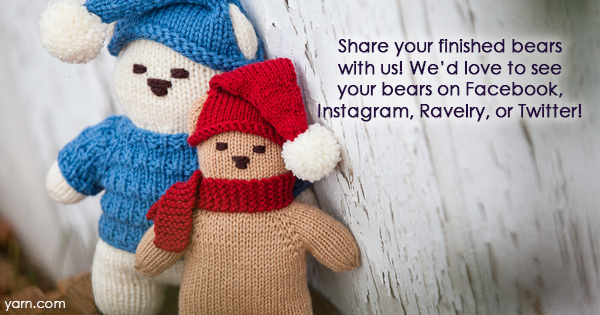 We would love for you to share your bears with us on Facebook, Ravelry, Instagram, or Twitter. We can’t wait to see how you’ve accessorized yours!